Louise wanted to be a nun all her life, but her priest insisted she enter into an arranged marriage instead. She came to love her husband very much, and they had a little boy. But then her husband got sick and died. Louise and her son had to move from their comfortable home to a poor neighborhood. There, she started to go to Saint Vincent de Paul for spiritual direction. He was very busy, and he needed somebody who could help him serve the poor by understanding their needs. Then Saint Vincent realized he had the perfect solution to his problems in Louise de Marillac. Louise considered this an answer to her prayers. She started working with St. Vincent and training other women to help. Eventually, the Daughters of Charity became a full-fledged religious order and Louise finally became a nun as she had always wanted. Sometimes, we feel a deep urging in our hearts to do something great for God, but it’s not the right time. 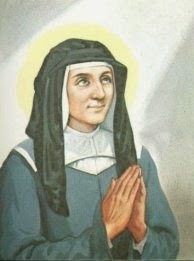 For Saint Louise de Marillac, her years of being married, falling in love with her husband, and raising her son prepared her to serve poor women and children in a very compassionate way. Today, pray that God will give you the patience to accept His perfect timing for your life. Saint Louise de Marillac, pray for us!